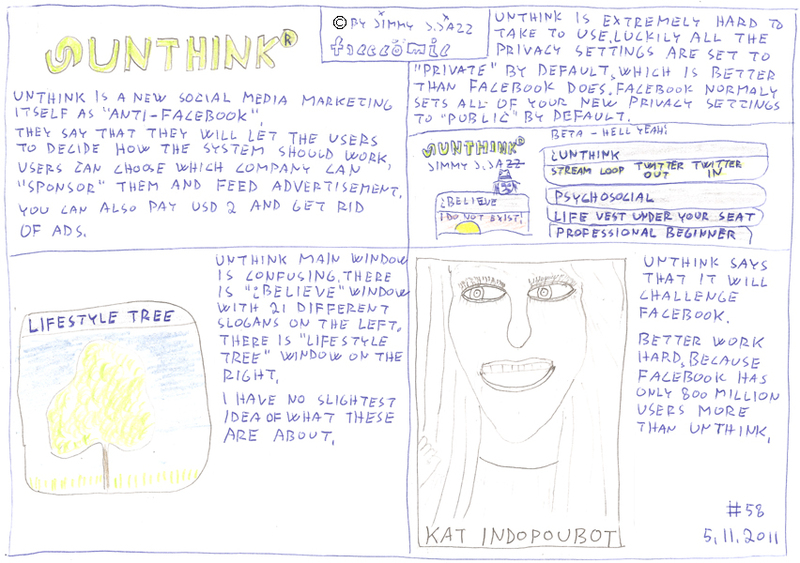 Unthink is a new Social Media marketing itself as "Anti-Facebook". They say that they will let the users to decide how the system should work. Users can choose which company can "sponsor" them and feed advertisement. You can also pay USD 2 and get rid of ads. Unthink is extremely hard to take to use. Luckily all the Privacy Settings are set to "private" by default, which is better than Facebook does. Facebook normally sets all of your new privacy settings to "public" by default. Unthink main window is confusing. There is "iBelieve" window with 21 different slogans on the left. There is "Lifestyle Tree" window on the right. I have no slightest idea of what these are about. Unthink says that it will challenge Facebook. Better work hard, because Facebook has only 800 million users more than Unthink.